The increase in organic crops in the Klamath Basin has spurred a lot of interest in better understanding how mineralization of soil organic matter can release stored organic compounds into plant-accessible forms. Tulelake's rich dark soils are of particular interest due to their high organic matter content and the potential for them to release a significant amount of nitrogen and other nutrients over the course of the growing season. Recent research by Dr. Daniel Geisseler, Assistant Cooperative Extension Specialist in Nutrient Management, is aimed at better understanding nitrogen mineralization in California soils and finding more accurate methods of estimating nitrogen mineralization under different conditions. Below is a preliminary report detailing Dr. Geisseler research being funded by the California Institute for Water Resources (http://ciwr.ucanr.edu/). 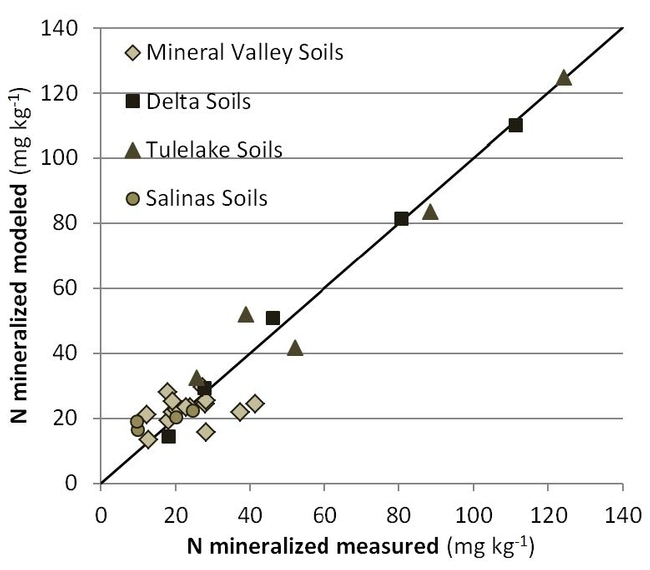 The report contain results from several locations in Tulelake and sheds a lot of light on the amount of nitrogen mineralized from CA soils under different conditions. Due to high groundwater nitrate concentrations, California growers are facing increasing pressure to improve nitrogen (N) use efficiency in crop production to reduce nitrate leaching. To maintain high yield levels, growers need accurate estimates of N availability that doesn't come from fertilizer so that they can adjust fertilizer application rates with confidence. This project aims to determine N mineralization rates in in a variety of agricultural soils from California. The data shall be used to develop a simple online tool that allows estimating field-specific N mineralization rates. 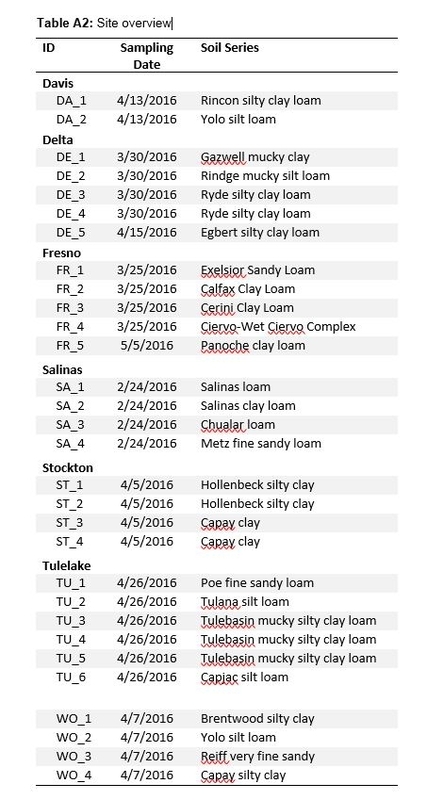 In spring 2016, we took undisturbed soil cores from 30 fields under annual crops located in the northern half of California, namely in the Central Valley from Fresno in the south to Woodland in the north, in the Salinas Valley, in the Delta and in in the Tulelake area. The soils had a wide range of soil organic matter (SOM) contents, with the highest values, ranging from 6-23%, found in soil from the Delta and Tulelake area. The SOM contents of the soils sampled in the Central and Salinas Valleys were much lower, ranging from 1.2-2.6%. The cores were incubated at different temperatures for 10 weeks. The temperatures chosen for the incubation were 5, 15, and 25 °C (41, 59, and 77 °F). The results show that N mineralization increases exponentially within this temperature range. The temperature response differed little across regions. A model based on total soil carbon (C), total soil N, pH and particulate organic C was best in predicting N mineralization based on soil properties. While the model predicted N mineralization very well in soils with a higher SOM content, it was less successful in low organic matter soils, where interactions with soil minerals and cropping history may strongly affect N mineralization rates. These factors shall be included to improve the model. Figure 1: Location and range in soil organic matter (SOM) content (SOM) of the sites sampled in spring 2016. California is a highly productive agricultural region. Its nutrient intensive production, however, has led to increased nitrate concentrations in the groundwater with a large proportion of this nitrate likely originating from fertilizer use in agriculture. California growers are now facing increasing pressure to improve N use efficiency in crop production to reduce nitrate leaching. At the same time, growers need to maintain high yield levels to remain competitive. This is only possible when non-fertilizer N inputs can be quantified accurately, so that fertilizer application rates can be adjusted with confidence. Besides residual nitrate and nitrate in irrigation water, N mineralized from organic material during the growing season can be a major source of crop available non-fertilizer N.
The objectives of this project are to study the temperature response of soil N mineralization and to determine N mineralization rates for a wide range of soils from California, and to develop a simple online tool that allows growers and crop advisers estimating field-specific N mineralization rates. In collaboration with local farm advisors we selected field sites in different regions of the state with widely different soils and climatic conditions (Figure 1). Fields under annual crops with no recent history of legume cover crops or manure applications were selected, in order to minimize the confounding effects of N mineralization from recently applied organic material. The fields represent the major soil series in each region. Samples from a total of 30 fields were collected in spring 2016 (Figure 1). The fields were divided into 3 blocks, which served as replicates for statistical analyses. Information about the cropping history was obtained from the growers. Undisturbed soil cores (2-in. diameter, 6 in. long) were collected from a depth of 3-9 inches, representing the top foot of the profile. Samples from the soil surrounding the cores were taken from the same layer at the same time. These samples were sieved, analyzed for soil moisture, ammonium and nitrate concentrations, total soil C, total N, particulate organic matter, pH, and EC. Additional analysis will be carried out in the coming months. In addition, soil was sampled from the same layer for a greenhouse trial. For more information on the sampling approach, please see our video at https://youtu.be/isgdNc5hXqo. The undisturbed soil cores were incubated for 10 weeks at different temperatures (5, 15 and 25 °C) at an optimal moisture content of 60% water filled pore space to determine N mineralization rates and their temperature response. At the end of the incubation, the cores were sieved and analyzed for soil moisture and mineral N concentration (ammonium and nitrate). Net N mineralization was calculated by subtracting the initial concentration of mineral N (determined in the samples from the surrounding soil) from the mineral N in the cores at the end of the incubation. The results of the incubation and from the soil analyses were used to develop equations to express N mineralization rates as a function of soil temperature and soil properties. The temperature response curve across all sites was determined by non-linear regression. For each individual site, the net N mineralization was first normalized by setting the N mineralization at 25 °C to 100%. In addition, a greenhouse trial was carried out to determine N uptake by tall fescue (Festuca arundinacea) over a period of 6 months. These results are not available yet. This report summarizes preliminary results from the first year of study. 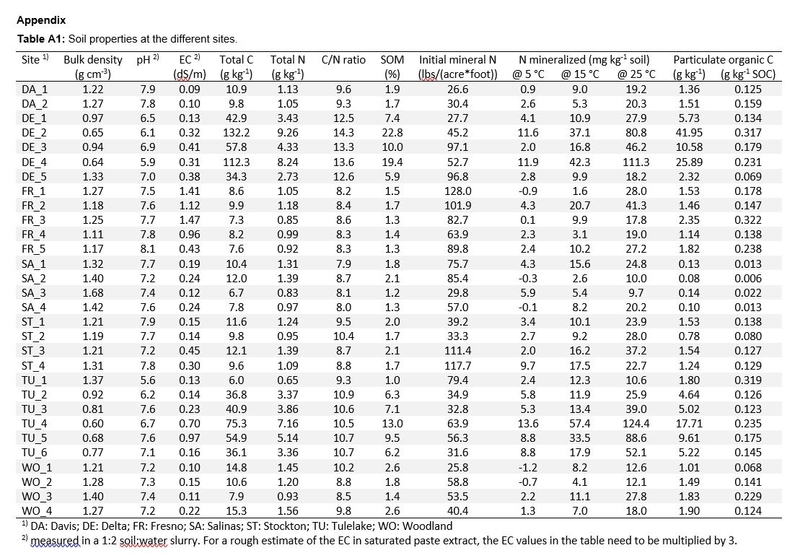 Bulk density in the undisturbed cores ranged from 0.60 to 1.68 g cm-3 (Table 1). The lowest values were found in the high organic matter soils from the Delta and Tulelake basin. An estimate of bulk density is needed to convert concentration to lbs/acre. When residual soil nitrate is measured, it is generally converted from ppm to lbs/acre per foot using a factor of 3.5-4.0. This factor is based on a bulk density of 1.3-1.5 g cm-3. Using the same conversion factor for soils with a lower bulk density results in an overestimation of residual soil nitrate. For example for a bulk density of 0.8, a factor of 2.2 is appropriate. Mineral soils collected in the Central and Salinas Valleys had a relatively low SOM, ranging from 1.2-2.6%. 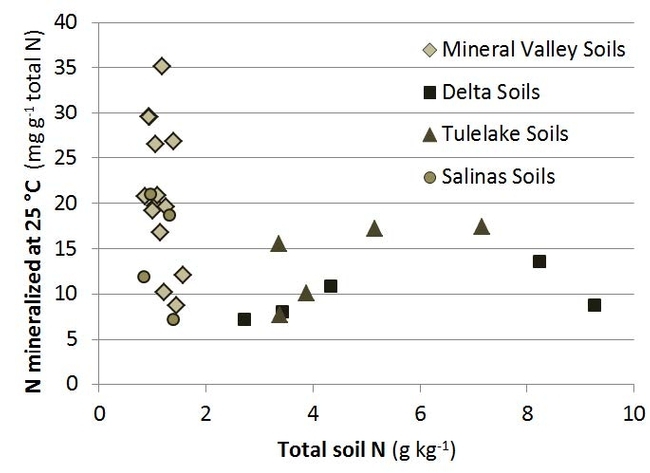 Soil organic matter contents were much higher and more variable in soils from the Delta and Tulelake basin, with values ranging from 5.9 to 22.8%. In both areas, soils formed under anaerobic conditions, which resulted in an accumulation of SOM. Most soils had a pH between 6 and 8. 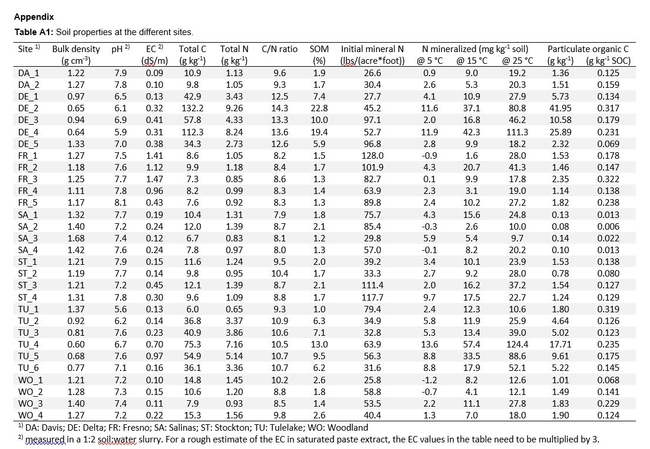 Tables A1 and A2 in the appendix contain a detailed list of properties for each individual soil. The amount of N mineralized in undisturbed soil cores at 25 °C during the 10-week incubation varied considerably. 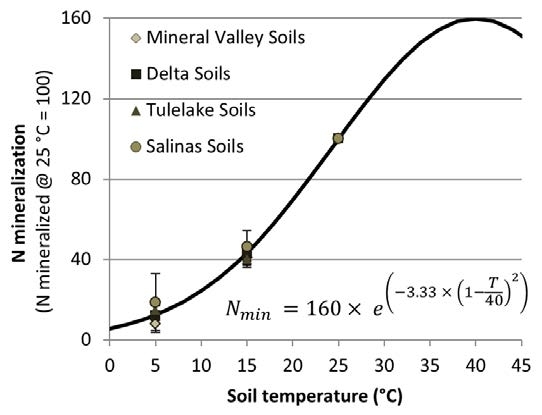 In general, N mineralization was lower in mineral soils from the Central and Salinas Valleys compared with soils from the Delta and Tulelake basin (Figure 2). This result reflects the amount of SOM present. The N mineralization rates have not yet been converted to lbs/acre because they represent rates at optimal moisture contents. Therefore, the values from the incubation may overestimate the N mineralization rates under field conditions. The effect of soil moisture on N mineralization in these soils still needs to be determined. Figure 2: Net N mineralization rates of the 30 soils included in the study. The total amount of N mineralized in the mineral soils from the Central Valley and from Salinas varied less among sites than the values from Delta soils and soils from Tulelake. In contrast, when N mineralization is expressed in % of total soil N, mineral soils from the Central Valley are much more variable (Figure 3). This is likely due to the fact that interactions with soil minerals and cropping history affect N mineralization much more than in soils with a high SOM content. In the Delta and Tulelake basin, soils formed under water saturated conditions. In the absence of oxygen, decomposition is incomplete and organic material accumulates. Even though the decomposition and mineralization rates increase much when the soils are drained and used for crop production, the average N mineralization rate per unit total soil N tends to be lower in these soils compared to mineral soils from the Valley. 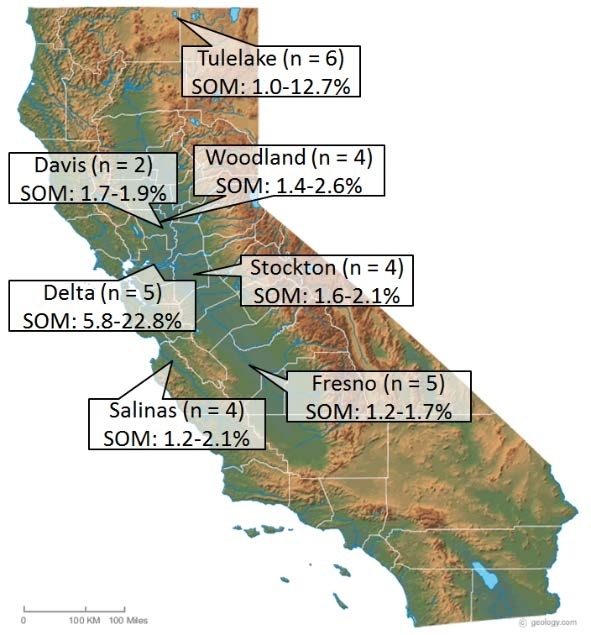 This may suggest that the SOM is more stable in soils from the Delta and Tulelake basin than in mineral soils from the central Valley, where a larger proportion is derived from recent crop residues. Figure 3: Net N mineralization as a function of total soil N.
During our incubation at 25 °C for 10 weeks, between 0.7 and 3.5% of total soil N was mineralized. This result is in agreement with a widely used assumption that between 1 and 3% of total soil N is mineralized during the growing season. However, this is an inaccurate estimate because (i) incubations are generally done with an optimal moisture content and therefore represent the potential N mineralization rate, (ii) the growing season depends on the crop, the variety and the local conditions, and (iii) soil temperature fluctuates during the year and among regions. Therefore, planting date and field location affect the amount of N mineralized during the growing season of a specific crop. For an accurate estimate of N mineralization rates, site-specific factors need to be taken into account. While we have not yet studies the effects of soil moisture, we have determined the temperature response of N mineralization. where T is the soil temperature in °C. For the model, the temperature at which the N mineralization rate reaches a maximum was set to 40 °C (104 °F). The temperature response curve differed little across regions. Using soil temperature data from CIMIS stations, this temperature curve allows calculating N mineralization rates based on soil temperature. Figure 4: Soil temperature response curve of N mineralization based on undisturbed soil cores taken in 30 agricultural fields and incubated at 5, 15, and 25 °C for 10 weeks. Figure 5 shows the relationship between measured N mineralization N rates and modeled rates. The results clearly show that SOM is an important property determining N mineralization rates. Including POC considerably improved the model. Particulate organic C is a measure of the availability of organic matter to microbial decomposition. Including POC improved the accuracy of the model, especially for soils with a high SOM content. However, Figure 5 reveals that the soils from the Central Valley do not follow the general trend very well. These soils have a low SOM content. Interactions with soil minerals and cropping history may affect N mineralization rates in these soils much more than in soils with a high SOM content. We are currently determining several sol properties that may be related to the interactions between the mineral and organic fractions. These soil properties shall be included in future models. Figure 5: Comparison between measured and modeled N mineralization. Additional soil analyses are currently being performed and the results from the greenhouse trial are being analyzed. We hope to expand the study with a similar number of sites sampled in spring 2017. This project is funded by a grant by the California Institute for Water Resources. We would like to thank the growers for letting us take soil samples in their fields and for sharing the management history with us. Without the following farm advisors, who helped us with site selection and soil sampling, the project could not have been carried out: Brenna Aegerter, UCCE San Joaquin County; Nicholas Clark, UCCE Kings, Tulare, & Fresno Counties; Gene Miyao, UCCE Yolo, Solano & Sacramento Counties; Michelle Leinfelder-Miles, UCCE San Joaquin County; Richard Smith, UCCE Monterey County; Rob Wilson, UC ANR Intermountain Research & Extension Center. Thanks a lot! Most of the field and lab work was done by Ken Miller, Kelley Liang, Patricia Lazicki, and Irfan Ainuddin who work in the Nutrient Management Lab at UC Davis.